Green Diamond, Miami Beach, with its glowing green diamond crown, can be seen miles away at night and is one of two instantly recognizable luxury oceanfront condo towers rising way above the oceanfront Miami Beach skyline. Blue and Green Diamond, Miami Beach, are luxury oceanfront condos offer everything you’re looking for: including oceanfront penthouses with ten-foot ceilings from the forty-first to forty-third floors. Also, two-story Tower Suites are available on the forty-fourth and forty-fifth floors with a personal swimming pool in each suite on the upper-level balcony overlooking all of the Miami Beach Skyline and the Atlantic Ocean. Breathtaking in concept and execution, Blue and Green Diamond are the figurative and literal “High Life”. 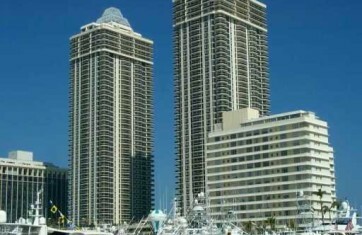 The two luxury oceanfront condominium towers of Blue Diamond and Green Diamond are located on 500 feet of pristine beach on Miami Beach’s famed Golden Mile, and offer one, two, and three bedroom luxury oceanfront residences and unmatched penthouses, as well as beach cabanas and excellent storage facilities. The Club ‘House’ they share nestled between the two towers is often mistaken for a beachfront mansion. Green Diamond is the northern half of the Blue and Green Diamond pair. Both offer 45-stories of spectacular views of the Atlantic Ocean, Intracoastal Waterway, and Miami and Miami Beach’s stunning city skylines. While seemingly a world away, the Blue and Green Diamond are ideally situated minutes from world-renowned South Beach, the impeccable shops of Bal Harbour, and SoBe entertainment and fine dining. Miami Beach’s Mid-BeachMillionaires Row area has long been very desirable because it is a narrow strip of land between the Atlantic Ocean and Indian Creek, allowing for beachfront living as well as ocean-access boating from the Indian Creek docks on the other side of Collins Avenue! This is the unique lifestyle so sought-after and iconic of South Beach and Miami Beach, and it’s located just a bike ride from Lincoln Road pedestrian Mall at 18th Street. These two towers are home to one of the most expansive beachfront clubhouse facilities imaginable. This Mediterranean wonder, encompasses 16,000 square feet of amenities. The lobbies in both Diamonds have recently been renovated to the highest standards. These are some of the best-priced luxury oceanfront condominium residences anywhere in Miami Beach. A must see to be appreciated: the clubhouse alone is worth the trip.